With a design that has stood the test of time, the Jullian easel combines a sketchbox, easel, and canvas carrier in one, saving time and money for the location or demonstration painter. It is handcrafted of naturally dried beechwood, which will develop a beautiful golden tone with age. It has brass-plated fittings in the tradition of fine cabinetry. 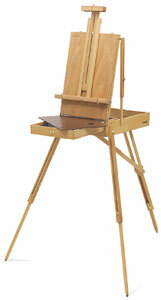 The easel stands up to 70-1/2" high, and holds a canvas up to 31-1/2" tall. Folded, the full box easel measures only 16-5/8" wide × 7" deep × 22" high. The two front legs fold away compactly to the side, while the adjustable rear leg disappears neatly into the underside of the easel's sketchbox. Adjust the legs and the tilt to whatever height and angle best suit your painting style — forward for pastels, vertical for oils, and flat for watercolors. The Jullian comes with a set of spikes, to further enhance the stability of the easel when needed. The weather-resistant, metal-lined box holds paints, brushes, and accessories. Remove the upper drawer, and there's even more storage space underneath. When not it use, the easel serves as a canvas carrier. A finished painting can be positioned on the outside of the folded easel and carried until completely dry. The Jullian comes pre-assembled and includes a mahogany finish wooden painting palette, a leather carrying handle, a leather shoulder strap and a FREE carry bag. Jullian Easel Organizer Drawers — Organize these extra drawers by media type, and change supplies for your Jullian Easel Box in an instant. Jullian's Studio Organizer drawers are chrome-lined for easy cleaning. They close securely for convenient carrying in the field, and the cover doubles as a palette. A blank label is included. Drawers fit the Jullian Full Box French Easel only. ® Jullian Paris is a registered trademark.